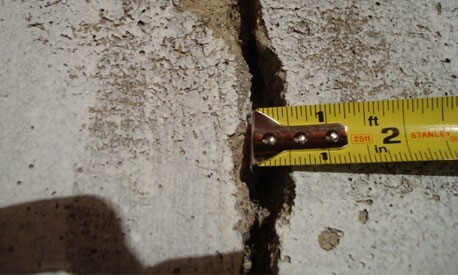 Fixing concrete cracks and general concrete repair are essential for both the safety and aesthetics of your structure. Concrete cracks can appear in a variety of environments. Loading bays, bridges, walkways and roads, as well as home garages, patios and balconies. At Rawlins Paints we have a wide variety of products applicable to all the above. This guide should help get you a better idea of what you may need for your project and what sort of method could suit. Before approaching concrete repair, YOU SHOULD ALWAYS SPEAK TO A STRUCTURAL ENGINEER. We are here to supply the products and can help with direction as to which, but Health and Safety is imperative if repairing a structure and you MUST make sure any work carried out is appropriate and safe. Talk to our technical team too, take every precaution needed. Why should you fix a crack? Is structural repair required? Or a non-structural aesthetic fix? Is the crack active or dormant? Restoring an active, non-structural crack. Restoring an active, structural crack. However. Before diving headfirst into concrete crack repair, there are some essential facts that need to be identified. Without the correct diagnosis of the problem, the solution could be ineffectual. We shall look to cover these essentials one step at a time. The first factor to establish is whether your structural foundations have been compromised. If your crack has caused structural damage, then you are going to require a flexible material and comprehensive technique to combat this. If the crack is non-structural, or an aesthetic/decorative issue if you will, it is still imperative to address the issue before it worsens or spreads, even if this is just monitoring the situation to begin with. If you are unsure? Then fix it! Secondly. Before beginning any repair work, it is important to recognise whether the crack in question is dormant or active. 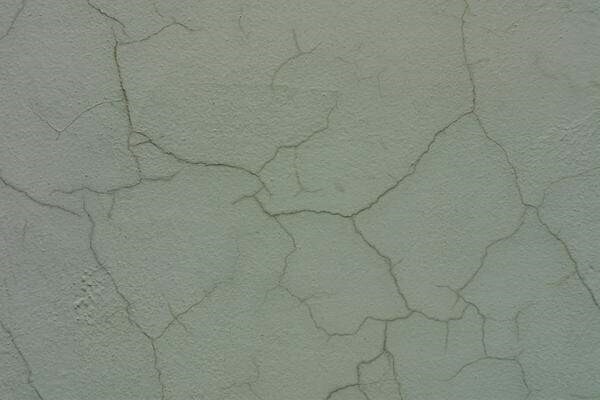 A crack at risk of growing or moving and causing greater damage would be considered active, therefore needing immediate attention, whilst dormant cracks are stable but still worth waterproofing and sealing. Somewhat self-explanatory terminology, I appreciate. The most straightforward and cost-free method of deciphering whether a crack is active or dormant, it to measure the crack in two or three places at regular intervals. Say once a day or once a week. This should show whether the crack is fluctuating or not. 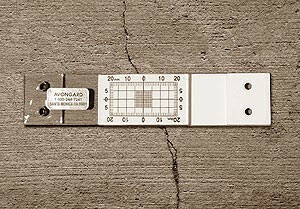 A Demec gauge, Tell Tale crack monitor or handheld measuring microscope can be used to decipher the width of the crack. Or, if the suspected movement is more emphatic, why not throw caution to the wind and use a thin marker pen and tape measure to record the damage! A dormant crack often has steel reinforcement beneath the concrete. Underlying steel does not prohibit cracking, but it does limit the width that it can reach. It also stabilises the alignment of your concrete slabs and spreads the load-bearing. Drying shrinkage due to non-idyllic temperatures and curing methods is usually active at first but settles into a dormant crack. Remmers Epoxy Quick Fix is a universal, fast-reacting resin mortar that horizontal and vertical cementitious surfaces. All of the components are included in the one bucket, and it is ready for footfall after 2 hours. It fills and repairs missing areas and broken out areas quickly, a really good immediate solution. Sikadur 41 CF Rapid can be used on horizontal applications that are found in lower temperatures. It is a highly versatile, three-part adhesive mortar that can be applied to concrete, stone, ceramics, bricks, steel, iron, aluminium and wood. Sikadur 41 CF Normal is also available on our website. If your concrete crack is on a vertical wall, Rust-Oleum 5110 Verti-Patch is a very strong epoxy repair mortar with lightweight fillers that cures as hard as granite. It can be drilled after curing, can be used externally or internally, and is non-shrink. If your concrete surface is rough or has a static/dynamic load, Remmers Betofix R4 is a fibre-reinforced PCC dry mortar. Remmers Betofix R4 is compliant with DIN EN 1504-3 (making it class R4). It combines bonding, coarse fine mortar and corrosion protection into one product. For a fine crack repair mortar that dries in 3-4 hours, Rust-Oleum Epoxyshield Fine Crack Repair is an affordable, solvent-free liquid for cracks up to 3mm wide. This is more suitable however, for temperatures around 20c. Finally, for an anti-ageing, extremely elastic product that is compatible with various paint systems, we suggest Rust-Oleum Mathys Elastofill, for all weather forecasts on vertical walls. An active, non-structural crack is one which has not currently corrupted the foundations but is in grave danger of spreading and doing so. If you use a rigid material like you would with a dormant eyesore, it is likely to crack either in the repair material or the nearby concrete. A flexible repair product is essential. Polyurethane injection can be used to repair a non-structural crack, but the most economical is the employment of routing and sealing. Routing and sealing isolates your non-structural crack, extinguishing any risk of deeper damage. Whilst it can be used on walls too, it is perfect for floor and ceiling work. How much load-bearing do I need? How heavy is my foot traffic? Would it better suit medium use or heavy duty? A v-shaped trough needs to be created at the root of the cause. Ideally, the trough should be twice as wide as it is deep. This will allow the flexible sealant to tolerate any future movement and mould into it. If you go for a 1:1 width and depth this is also okay, but a trough much deeper than it is wide will limit what the sealant can do. Where possible, the trough should be two inches in width and one inch in depth. If that large a funnel shape is not possible, then the same scale should be observed. Rustoleum 5160 Flexible Joint Filler offers an affordable, flexible polyurethane solution for an active crack. It allows the floor to expand and collapse, as we discussed in the trough sizing, and allows for heavy traffic. It also cures in 8-12 hours, making it perfect for hospitals, supermarkets, showrooms, schools – anywhere that wants to avoid significant closure. Remmers Multi-Sil NUW is a joint sealing compound for work that requires special mechanical or chemical loading capacity. It can be used for stain-free work on smooth and open-pored natural stone making it great for agricultural engineering, food and hygiene areas and medical treatment rooms. As with the dormant crack solutions, Sika offer an extensive and impressive range of waterproofing sealants with a high calibre finish. SikyHyflex 250 Facade is a one-part sealant with a movement capability of +100/-50 %. Sikaflex Construction+ is a cheaper option with lesser movement capabilities. There is a range of strengths to suit your individual issue. When it comes to active, structural cracks, ALWAYS CONSULT A STRUCTURAL ENGINEER. If you are rebuilding stairs, buildings or bridges, anything that could collapse, you MUST err on the side of caution and seek professional help. The products below are listed as guidelines to get you looking in the right place. Before buying, please speak to our technical team. For an active, structural crack, routing and sealing is an option if the correct sealant is chosen. But the more comprehensive technique often used to ensure full waterproofing and to minimize any future damage occurring, is polyurethane injection. Polyurethane resins can seal and waterproof cracks in your concrete as small as 0.05 millimetres. The resin injected into the crack reacts with the water to form an impenetrable yet flexible gel seal. The top hydrophilic resins surge into any microscopic cracks further down the foundations and seals with any wet concrete it runs into. With their flexible components, these resins should even adjust to combat any future cracking in the concrete. Remmers IR PUR 2k 150 is a flexible injection resin for sealing water-bearing cracks and porous, water-soaked areas in concrete and masonry, grouting of construction joints and dilatable filling of cracks. It has numerous certifications in its field too back it up too. Sikaflex PRO-3 is a high-performance polyurethane sealant. It is suitable for interior and exterior floors, is chemical and abrasion resistant, and comes in user-friendly ‘sausages’. Due to its resistant components, it is ideal for the food industry and public walkways. For sewage, chemical plants and more pungent areas such as stables, public toilets, and garages where oil and petrol are prevalent, Remmers PU AW is an excellent polyurethane sealing compound is not only water resistant, but fuel, oil, salt water, weak acids and sewage resistant. This is available on request, however is subject to a 7-10 day lead time due to its complexity. We at Rawlins Paints are not only dedicated to advising what products you should pick off our shelves, but also to instructing informatively as to how you can apply them safely, and successfully. For an in-depth guide on how to repair concrete floors, please read our blog on the application process. Whether it be to discuss exactly which product is appropriate (which we strongly advise when repairing concrete structures), you are always welcome to call our technical team on 0113 245 5450.